Once known as Dutch Hill, the eastern end of 42nd Street used to be one of the most blighted parts of New York City. A granite cliff just west of First Avenue hemmed in slaughterhouses, tanneries, breweries and stockyards. Thousands of squatters lived in shacks. On the hill at East 40th was a brownstone referred to as Corcoran’s Roost, home to a lawless gang led by Jimmy Corcoran. During the late 1870s many of the shanties were bulldozed and replaced by row houses. However, the stench emanating from the industries along the East River kept further development at bay. By 1920, the architect and real estate developer Fred F. French made plans to transform the area into an urban Utopia. French sought to build a “city within a city,” similar to the commercial development underway at the same time at Rockefeller Center, that would serve as a residential enclave. 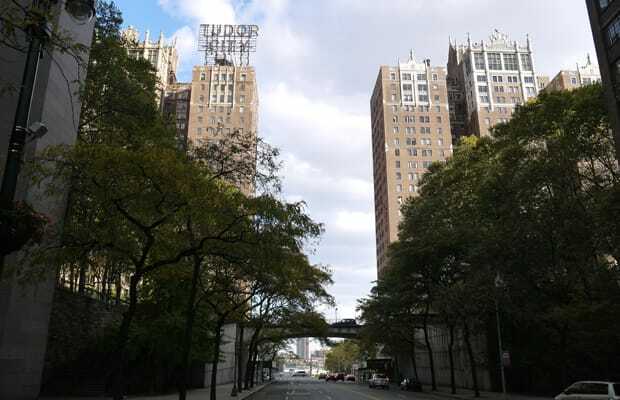 It was called Tudor City.